Minnesota Theater Love: Miss Richfield 1981 Answers Our Burning Questions! Miss Richfield 1981 Answers Our Burning Questions! After seeing the hilarious Miss Richfield 1981 in Trailer House to the State House - Santa-Style! at the Illusion Theater (read our glowing review here), we had a few burning questions for highly acclaimed pageant title holder. Despite the grueling schedule of her super-hot holiday show, Miss Richfield 1981 graciously agreed to answer a few of our questions with her customary style and verve. Don't forget! 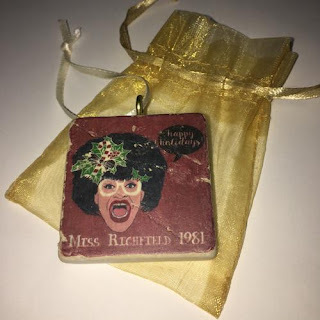 If you missed Miss Richfield 1981 this holiday season, she will be back at the Illusion Theater in February for a sneak preview of her new show: Miss Richfield 1981's 2017 Prog-rum. What's your preferred form of address? Should we address you by your full title at all times, or do you have an acceptable abbreviation? I appreciate your asking! I always go by my beauty title of Miss Richfield 1981. It is bestowed on so few that I feel an obligation to honor my heritage of beauty for those women who are not pretty enough or perhaps too heavy to be pageant winners themselves. Minnesota gets you in the winter, and Provincetown gets you in the summers. What's the difference between performing between the two? Surprisingly, not much! I adore both places and of course folks here in Minnie are usually familiar with The Hub and other Richfield hot spots, like Sandy’s on 66th & Penn! I reference those in Ptown, but only for my own fulfillment. Both places offer great audiences that are very mixed and probably about 50 percent homo. I actually have a fair number of kids at my shows in Ptown these days. I noticed that your program credits Randy Rainbow for video editing. What's your relationship with the fabulous Mr. Rainbow, and more importantly, can we all go to a piano bar soon? I’ve known Randy for years and he’s helped me on several occasions. I’m not sure how much longer that will last, since he’s become a star, and so deservedly so! And I guess that’s the one and only case to be thankful for our new, orange president! 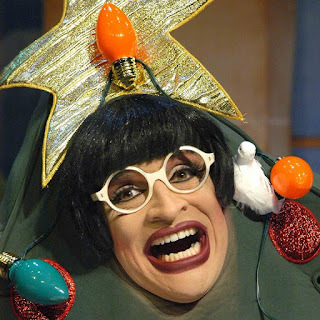 Do you see branching out into more online content/social media (a la Mr. Rainbow)? Especially considering your upcoming Minnesota Presidential campaign? I already do so much, as a woman of the millennium. I make Facebook films and have a website. So I guess the next thing is that I’ll be getting one of those cordless phones you all carry around soon too! Let's talk your work on cruise ships. Are they as fabulous as I've seen on The Love Boat, and are you the Charo of the contemporary cruise world? Any hilarious stories? Misunderstandings? Affairs with the purser? The cruises are so glamorous, but I spend most of my time down in the laundry with the Filipinos, trying to make some extra cash for my bus ticket home. But for normal guests, I think it’s pretty much exactly like the “Love Boat” days, and in fact I have actually met Charo. She is super nice and so amazingly talented. Such a joy! As your show starts, Michael Robins (your director) tells the audience to NOT put away their phones. With glee, people immediately began recording your intro. Can you talk about this departure from usual theater etiquette? What is it like for you to see all those phones lit up? You have to choose your battles, my dear. And that is one I find tedious and unnecessary. People want to talk and share and I want to be in the middle of that! Your skill is working the crowd is amazing. Care to share any times when it went really right or really wrong? There’s many stories, but one of my favorites was a very darling Russian fellow on cruise ship. I asked, “Do you know any Jews? He sincerely replied, “Yes, orange juice.” Ya can’t write that stuff! You are coming back in February for Miss Richfield 1981's 2017 Pro'grum. Whatcha got planned for us? “2020 Vision” is my brand new show! Although I have never had perfect vision, I think we all need to be seeing 2020 for the next few years! There's a lot of work to be done in our world today and I'll help you see many bright, happy colors - other than orange! My new show will also offer practical help too, such as avoiding a fiery apocalypse. Your clothes are amazing and beyond fabulous. So, why two watches? One for Richfield time and one for wherever I am at the time. Finally, and most importantly, YOUR LIPSTICK. What is it, and where can we get it? Thank you, but I don’t wear lipstick! Only natural beauty in Richfield! Our grateful thanks to Miss Richfield 1981 for her time, her answers, and her plentiful charm!